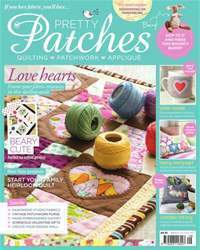 We’re making a New Year resolution to do a lot more sewing in 2015, and this issue of Pretty Patches will inspire you to do the same. We’ve put together a fresh collection of beautiful projects, from quick and easy makes to special pieces that you can enjoy stitching over the coming months. Traditional English paper piecing is experiencing a huge revival at the moment, and this precise hand-sewn patchwork technique is ideal for everything from assembling a full-size quilt to embellishing accessories such as bags and cushions. Choose from a range of projects to get you hooked on EPP, while our interview with maker and blogger Georgina Giles will encourage you to start piecing your own heirloom quilt.